Myanmar (formerly known as Burma) is the most recent addition to on the Southeast Asia backpacking circuit. Following government reforms and lifting of international sanctions in 2012, it’s become a favorite among travellers looking something a bit different, or perhaps just seeking an escape from the busy tourist sights and crazy party crowds in neighbouring Thailand. While it might not stay this way forever, Myanmar still feels authentic and mostly unspoiled by mass tourism. Locals may greet you with friendly curiosity and, to the bewilderment of travellers used to having to drive a hard bargain elsewhere in Asia, taxi drivers might just charge you the normal local rate (I know, shocking!). 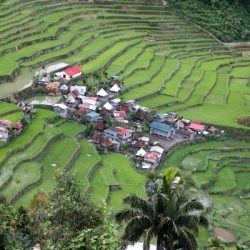 It’s a low-key destination perfect for those wanting to immerse themselves in the local culture, food, and nature, and don’t particularly need to be near any luxury beach resorts. The temples of Bagan are Myanmar’s star attraction, and while they are impressive I found the everyday experiences in Myanmar ultimately the most memorable. In the cities, you can grab a plastic chair at a roadside tea house and just watch the people passing by, often wearing longyi sarongs or a traditional cosmetic face paint called thanakha. You can rent a scooter and meander through the countryside, or take a train journey and enjoy the hustle and bustle on a creaking old train chugging its way through the landscape. You’ll get the most out of Myanmar if you can create your own little adventures. Don’t miss out on the food either. Go to a local restaurant and you might be delighted with an array of little plates and bowls, each containing something delicious. Foodie and traveller Anthony Bourdain has listed Burmese food as one of the most underrated in the world, and he’s probably right. I should mention that I visited Myanmar in mid-2013, which is a while ago now at this point. At the time of my visit the first ATMs were only just being connected to the international banking systems and travellers were still recommended to bring lots of USD in cash (this is not needed anymore). I’ve since been updating this post to reflect the changing visa regulations, permitted areas, and to include some tips from my correspondents who visited more recently. 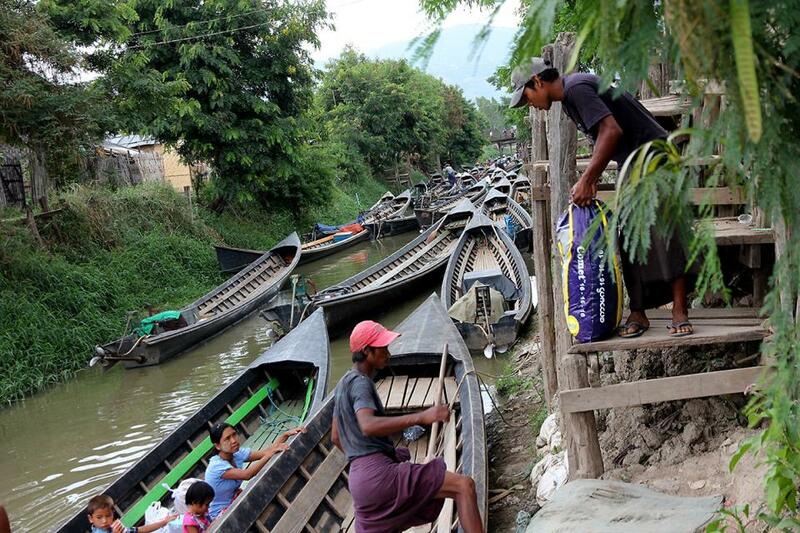 Boats arriving in Nyaung Shwe, near Lake Inle. 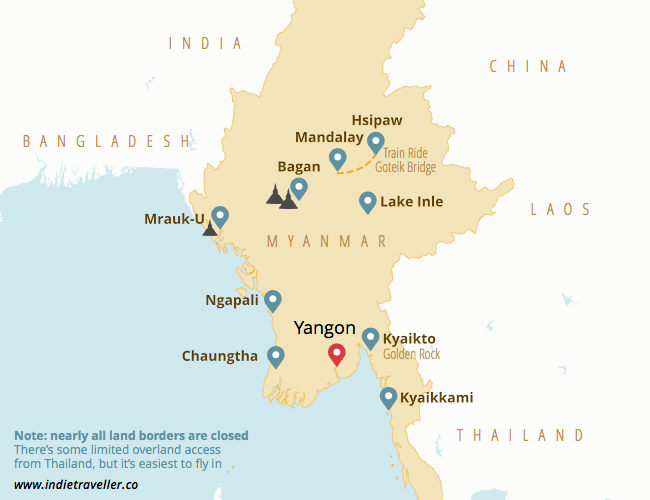 Travel in Myanmar can still be limited in some respects, as visitors are legally restricted from going to certain areas (in particular in the east and far north). Many travellers stick to what’s often called the ‘tourist triangle’ of Yangon, Bagan and Inle Lake, though plenty of other places are also accessible. The map below shows just a few of the best places to visit and top things to do in Myanmar. The top attraction in the north is no doubt the temple complex of Bagan, an archeological site with over 2200 ancient Buddhist temples and pagodas. Bagan offers spectacular views particularly at sunset, and it’s often (and rightly) mentioned in the same breath as Angkor Wat in Cambodia or Borobodur in Indonesia. There are some good treks and day-hikes in Myanmar especially around tourist magnet Lake Inle or the quiet town of Hsipaw. In the south you’ll find the commercial capital of Yangon, which is home to many markets, golden temples and chaotic little back-streets. In Kyaikto, east of Yangon, you can visit a Buddhist pilgrimage site which famously had a big Golden Rock perched on the edge of a cliff — this sight will be conveniently on-route if you’re entering Myanmar overland from Thailand via the most commonly used border crossing at Myawaddy. If you’d like to get away from the cities you can head for the coast, where Chaungtha and Ngapali are two small and barely developed beach towns. Mrauk-U on the far west coast is a temple complex similar to Bagan, though it takes a long time to reach and is much less visited (which can, of course, be the perfect reason to go). I didn’t get a chance to see Mrauk-U, but you can find more information and photo impressions of this place on this blog. While alternative itineraries are possible, many travellers ultimately end up spending much of their time around Yangon, Bagan, and Mandalay, and from there adding various excursions into other areas. 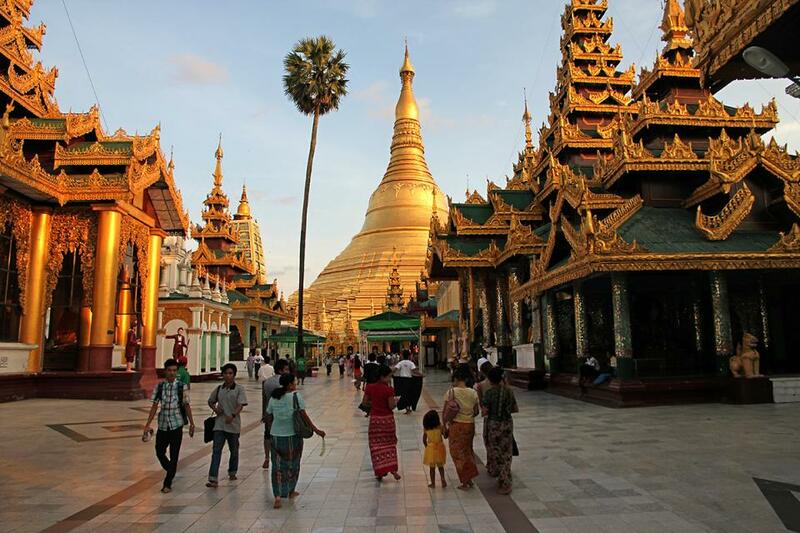 The main attraction in Yangon is the Shwedagon Pagoda, a huge gold-roofed Buddhist temple. Sunset is an excellent time to go as the dome will be gleaming beautifully in the orange sun. Apart from the pagodas, some people might feel that Yangon is not particularly rich in major ‘sights’ or museums, but I think there’s plenty to experience. You can have a wander through the streets and markets, or sit down in a tea house and watch people go about their business. Chinatown is a great area for street photography or to sample some very yum street food. Interestingly, motorbikes are outlawed in Yangon. According to rumor a well-placed individual in the army had once been in a motorbike related accident, and then decided the city could just as well do without them. I am not sure if this is exactly how this law came to be, though it has resulted in the streets of Yangon having a relatively quiet and pleasant character. Mandalay is the second largest city, and it’s mainly a great base for daytrips to various sights in the area. You can take a taxi or rent a scooter and make your way to the U Bien Bridge, Myanmar’s iconic 2.5 km long teak bridge across a lake, which is also the cover image of many Myanmar guidebooks. Another popular sight is Mandalay Hill, which has some great viewpoints where you can see the entire city below. With lots of motorbikes and many power generators set up outside of buildings (as backups for use during power cuts), Mandalay is not quite as walkable or as tranquil as Yangon. Still, there is a lot of interesting city life to see here, and you’ll find various markets with great Burmese street food. With over 200 temples dotted around the landscape, Bagan is quite the sight. You can explore the area on your own by foot or by renting bicycles, or get a guide with horse carriage to ride you around. Seen as a whole the temples of Bagan are especially impressive, though it’s maybe worth saying they’re fairly identical when exploring up-close, and many of the temples are essentially empty inside. By the time you’ve seen your tenth temple you’ll probably be ‘templed out’, but I’m only saying that to temper expectations slightly. You can easily spend a full day exploring the area. 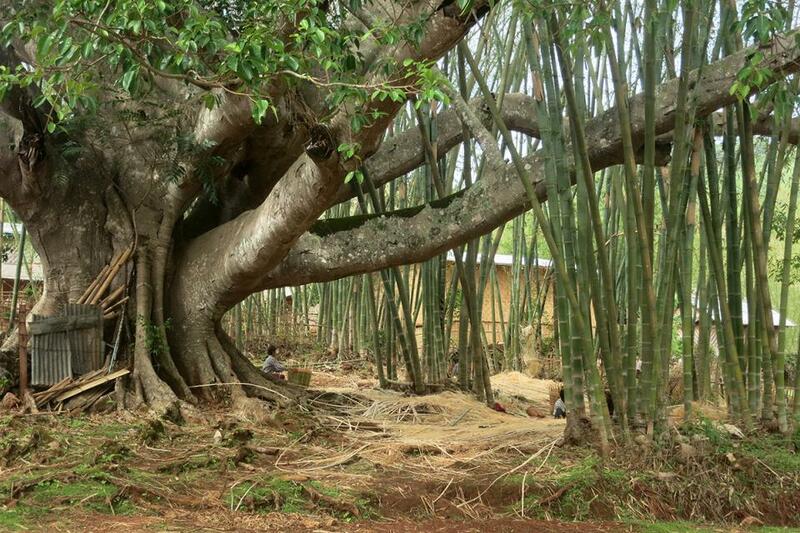 The town of Nyaung Shwe is the main travel hub in this area from which to go on excursions. A worthwhile trip is to Inthein, a sort of mini version of Bagan. The hundreds of small crumbling temples and stupas here are overgrown with gnarly trees and foliage, giving these ruins a bit of an Indiana Jones feel. 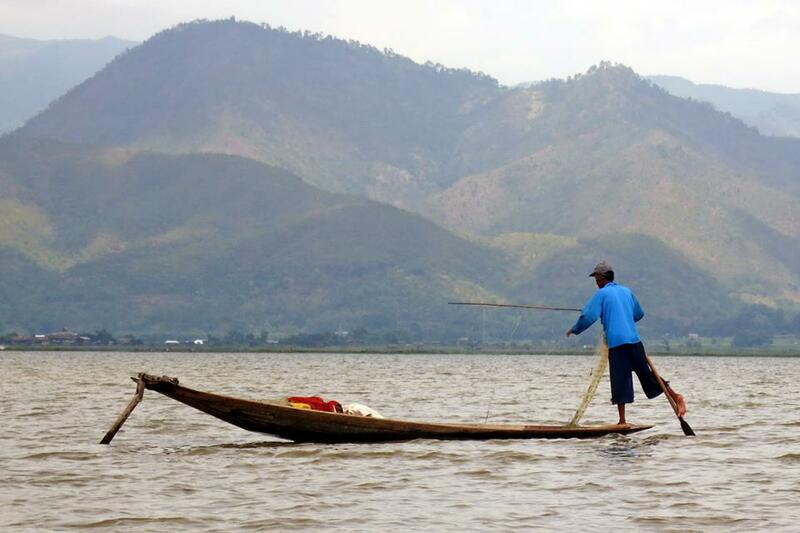 A good way to see the beautiful nature near lake inle—and much less tacky or invasive than the boat tours—is to go on a trek. I did a 2 day trek from the town of Kalaw to Nyaung Shwe which was very enjoyable. Riding a train in Myanmar is quite the experience! If you can find enjoyment just in the act of travelling itself, I recommend taking a train in Myanmar at least once. A popular route is the circle line in Yangon and you can read a great report about this on the blog Borders of Adventure. Another recommended journey is the one between Mandalay and Hsipaw. You can get a minivan or taxi to the town of Pyin Oo Lwin first and then get on the train in the early morning, so you can catch the best part of the route. It can be an uncomfortable journey however. If you are prone to motion sickness, the extreme swaying from side to side could easily trigger it. The train crosses a canyon via the Goteik viaduct which was built during British colonial times. While crossing this bridge was not quite as thrilling as the guidebooks made me believe, this journey is more about seeing the beautiful landscapes passing you by. It might also be just about the physical experience of being on a super old train. When it picks up speed you will surely be bouncing around the cabin, and you do have to watch your head if you’re near an open window as the trees and bushes get very close. At certain points during my ride, the train basically turned into a giant hedge trimmer cutting through the jungle, spraying leaves and branches into the carriage through the open windows. Hsipaw is a great base for hikes in the area east of Mandalay. Since it’s at a higher altitude, it’s pleasantly cooler here compared to Bagan or Mandalay. Travel information for Myanmar changes often and many details you find around the web are either outdated or inaccurate. I’ve collated the most important details here and last updated this page in May 2016. All of the places mentioned on this page are within the permitted areas for visitors. You are completely unrestricted in visiting any of these parts so long as you have a valid visa. Some areas of Myanmar do remain off-limits for tourist. For up-to-date information, check out the official government list or these maps at TourismTransparency.org. While the brown areas are labelled as requiring “prior permission”, this is rarely given and so you can basically regard these as closed. If you’re on a regional trip in Southeast Asia, or trying to combine another country with Myanmar, be sure to read this section carefully as there are various limitations around overland travel. The easiest way to get into Myanmar is to get an eVisa and to simply fly in. Budget carrier AirAsia flies to Yangon or Mandalay from Bangkok and Kuala Lumpur. This will involve the least amount of hassle. Many land borders are closed. Overlanding from China, Bangladesh, India or from Laos into Myanmar is not possible. 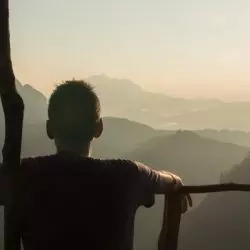 Some special tour packages do cross the China or India-Myanmar border, though these require a mandatory guide, private transportation and advance planning. Broadly speaking all of these borders are closed to independent travellers. If you need to connect between these countries, flying is your only option. Mae Sot – Myawaddy (central). This is the easiest way to get from Bangkok to Yangon, and by far the most popular crossing due to its proximity to various places of interest in Myanmar. Ignore any advice that says this crossing is one-way only; this is not the case anymore since a new road was completed in 2016. Phunaron – Htee Kee (central). Buses go from Kanchanaburi in Thailand to the small border town of Phunaron. It’s a small and remote crossing (you can’t find it on Google Maps) and on a slow mountain road, though it’s fully accessible. Mae Sai – Tachileik (north). You can cross here into Myanmar from Thailand’s Chiang Rai province, but you’ll get stuck if you don’t have a permit to travel further overland which is rarely issued. This crossing is, broadly speaking, not usable for independent travellers intending to go into Myanmar overland without restriction. Ranong – Kawthaung (south). This crossing lets you enter Myanmar from the far south. The roads here are reportedly rough, and in bad weather conditions overland travel to Myeik may not always be possible. A new border crossing connecting Thailand’s Mae Hong Song and Myanmar’s Kayak province is likely to open in the future. This would then make it practical to travel overland from the Chiang Mai area of Thailand into central Myanmar, and would finally make it possible to combine Thailand and Myanmar in one overland circle itinerary. Currently this is not possible. Keep in mind that eVisas are for airports only and will not be accepted at land borders. You need a regular visa to use the land borders. Applying for a tourist visa at a Myanmar embassy. This costs about €25 / $25 and requires a bit of paperwork and physically visiting an embassy. You can go to a Myanmar embassy if there is one in your home country, or you could go to the one in Bangkok, Thailand if you’re on a regional trip. Use the new e-Visa program. This costs double the amount but you can do it online. The only red flag here is that you can use the e-Visa only to fly into Yangon, Mandalay or Nay Pyi Taw airport. For entering overland, you need a regular visa. Ignore old advice to bring a big pile of US dollars in cash into Myanmar. This is pre-2012 advice! There are currently over 600 ATMs accepting foreign debit or credit cards in Myanmar. They are commonly found in airports, hotel lobbies, major markets (e.g., retailers in Bogyoke Market in Yangon) and bank branches. Over 1000 merchants now accept Visa and Mastercard, and they are concentrated particularly in and around Yangon and the ‘tourist triangle’ of Mandalay, Bagan, and Inle Lake. Withdrawing money is easy especially in tourist destinations. It may still be a little more difficult to find an ATM in more remote places, so it’s still a good idea to withdraw cash when you’re in cities and to keep some emergency dollars with you as well (though that goes for travelling in any country). Some older guidebooks will still give you tips and tricks on how to avoid your tourist money from flowing to the (then) military government. While the government is now only partially democratic and not without major controversies (particularly around the treatment of minorities), the concerns around tourist money supporting a military regime date mostly from pre-2011. Most government-owned hotels and such have now been privatised rendering this advice moot. For cost of travel information about Myanmar as well as other countries in the region, check out my Southeast Asia cost overview. Accommodation is not as cheap as in some other South East-Asian countries; expect to pay at least around $15 – $20 for a private room. It is advisable to book ahead your accommodation especially in high season. The extreme high season is in Oct-Dec, and I’ve been told things get pretty rammed during this time. The low season is Apr-Sep; I went during this time and while finding accommodation wasn’t too difficult, the climate can be very hot especially in the central plains (Mandalay, Bagan). You might have to take a little siesta in the afternoon to escape the heat. Internet is available though not very widely, and it’s often slow. Power cuts are frequent. Bring a headlamp or flashlight so you can find your toothbrush in the dark if needed. Have not specifically met a mother with child travelling in Myanmar but have in other nearby countries (Malaysia etc.). Yes I think Myanmar is safe (speaking for all of the touristed areas). I read that I can’t get Kyat outside Myanmar, and it’s not common to change Baht to Kyat when I get into the country. Should I just change the amount that I think I will spend for the whole trip from baht to US dollar now ? Or it is possible to change Baht to Kyat when I am there? Hey Natsu. I believe Baht is not widely accepted for exchange in Myanmar, though this was some time ago now and to be honest I don’t know if this is still the case. If you exchange to USD in Thailand, you’ll be able to exchange this to Kyat for sure though. You’ll be hit with two exchange fees in that case, but it’s probably worth it just to remove the uncertainty. Kyat typically can’t be exchanged anywhere outside of Myanmar btw, so be sure to spend it all or exchange what you’ve got left back to USD or Baht. Not problem. Baht is accepted in exchange counters in Myanmar. Great post – so informative. Can I ask advice? I’m a black female and intend to go to Myanmar – will it be safe for me to do so on my own? Hey Catherine. As far as solo female travel goes, yes – it’s a safe country and even petty theft is very rare. As far as race goes, as a white guy I might not be the best authority on this. That said, I’m not aware of issues within Myanmar apart from occasional awkward staring at international visitors (mostly in rural places where this is still a novelty). 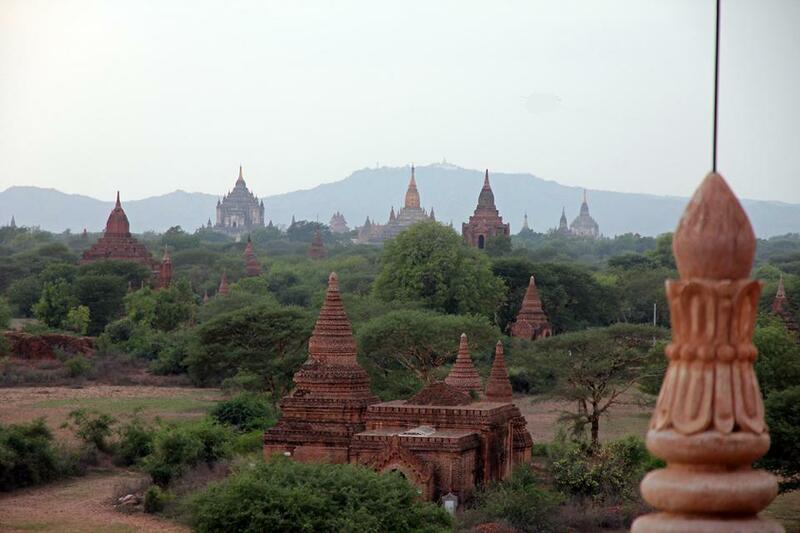 The temples at Bagan are so beautiful, thanks for sharing! I’ve been looking into Myanmar and seems like there’s really no way around the accommodation prices but to book early. I enjoyed reading through your write up, thanks! Every time I have found some new massage from your blog!I am a traveler and dreaming of visiting most historical places in the world.Thanks, dear your great help and keep it up. Hi Marek! As what I have read before, they only accept pristine US dollars on money changer. Is it still applicable nowadays? My friend and I will be travelling March 2017 and we are thinking which way would be better, bring dollars or just withdraw Kyats through ATM’s? I am also thinking of splitting the budget to $ and ATM’s but which should I have more. Thanks! More power! Hey Mark! ATMs are now plentiful in Myanmar so you can rely on them a lot more, particularly if you’re sticking mostly to the tourist trail such as the places mentioned on this page. Maybe call your bank and check to make sure if your debit card will work there (just because I’ve heard some rare anecdotes of people having trouble). Cash USD still needs to be crisp to exchange it – I would probably bring a smaller portion of your budget in USD, mostly as a backup. I personally do this anyway when travelling anywhere in Southeast Asia. Thanks for this great blog. A helpful addition might be that although the visa is statiny otherwise, the immigration officers don’t really seem to care whether you have an departure ticket booked or not. Me and some other travellers had not, which wasn’t a problem, even when we asked. Ps. 3G internet works pretty well in the cities at least and a SIM with 2Gb for a month costs 11.500 kyat. Hi there, we are planning our honeymoon in south east asia with Myanmar as our first country. We have booked our tickets to arrive in Yangon. We also want to see Mandalay, Bagan and Lake Inle. We wanted to go to Laos after Myanmar but I am so confused with the travels. I am wondering about the visa on arrival situation. We can get an eVisa but do we need our departure tickets out of Myanmar in order to get a Visa? And for travelling to Laos from Myanmar; are there no flights direct there? And is there really a way to get from Mandalay to Laos overland?? Is it safe for two Canadian travellers??? Travelling overland from Myanmar to Laos directly is currently not possible. The only way would be to cross the border overland to Thailand and go through Thailand from there. Flight connections with Myanmar remain pretty limited and the only connections to Mandalay I’m aware of are to Kunming in China and Chiang Mai in Thailand. So you’ll probably have to be a bit flexible around these limitations in order to combine Laos and Myanmar. For the visa requirements you might be better off checking the official Myanmar sources at the moment as I haven’t looked into the requirements in a while [EDIT: I’ve updated this post with the latest info]. As far as safety goes, this is fortunately not something to worry about. Myanmar is generally a very safe country. 🙂 Hope this helps! FYI, the dirt-cheap places (as in shared bath or shared rooms) in Yangon are in the center near Sule Pagoda. I always hear people talk about Motherland, but I’m sure there are people like me who prefer central locations. For people with pretty low standards, there’s a place that’s still only $6. The cheapie I’ve used bumped up to $9 after tourists started pouring in (used to be only $4…private fan room no bathroom, but they did improve the shared bath somewhat with the raised price). A private ensuite A/C room in other hotels can be had for $15, though. Yes that’s possible, but double check for the Thailand < -> Myanmar part if travelling overland as not all of the land borders between these countries are open. Also keep in mind that Laos to Hanoi takes about 30 hours by bus from Vientiane and is a particularly long/rough journey. Keep enough time in your itinerary for this, or skip it by flying. No particular safety issues for solo women so long as you take normal care. I think it is pretty safe in those countries, even Myanmar. Just dont go out when theres no need at 3 o’clock in the morning. Went for 1 month in 2013. It’s an amazing destination. Only negative for me was no cheap accommodations available. Spent previous month in Thailand. It cost me double for hotels & there were no hostile or guest house options in Myanmar. Can’t remember who I did my trekking with, sorry! I just found a company locally. 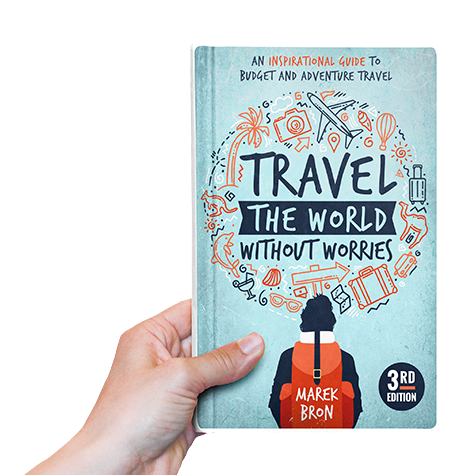 I am planning to travel to Myanmar in the second half of April and into May 2016 – how did you feel about the heat? I have been hearing so many mixed reports on how manageable the heat is. I wasn’t concerned about it, as I was in Cambodia when the heat was intense but the advisories people are giving me are causing me to have a second thought. I can confirm that it’s scorching in May with temperatures sometimes approaching 40 degrees C. For me, doing active stuff in early morning and having a mid-afternoon siesta was a practical necessity in the central plains (e.g. Mandalay, Bagan, etc.) during this time of the year. Still, it wasn’t unmanageable. If you dealt with intense heat in Cambodia before you probably know what to expect. Also, places like Lake Inle, Hsipaw, Pyin U Lwin and Kalaw are at a higher elevation and have a much more pleasant temperature… so you can always escape the extreme heat there. I’ve been to Myanmar 5 times, but only once during hot season–not even as hot as the time you’re planning! I was there for the second half of March (2012) and did most of my trekking in higher-altitude parts of Shan State (Kyaukme and Kengtung). Even so, very dusty, dry and pretty hot. 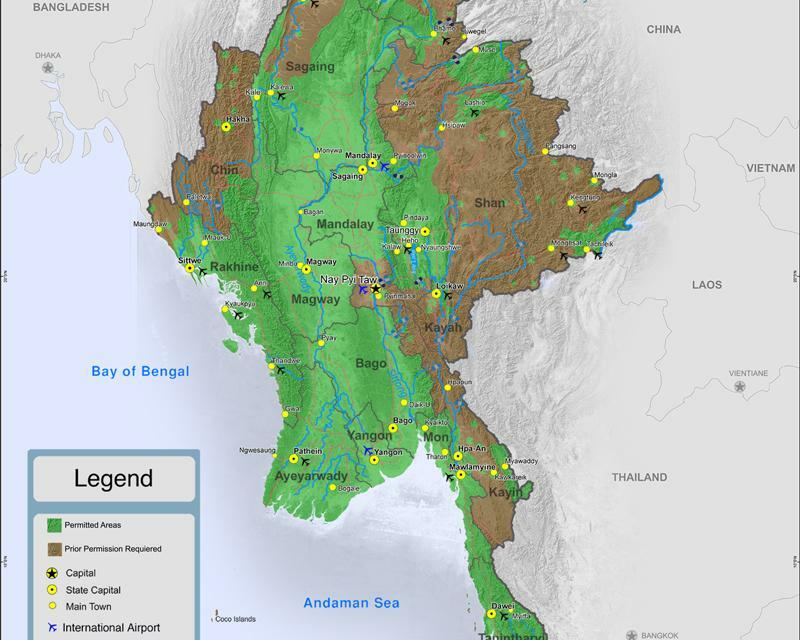 Then in Mandalay, Sagaing, Yangon it was only relatively dry-for-the-region (i.e. humid) and very very hot. Just standing around sweating. Mandalay is usually the most unbearable with heat, it feels like there’s only about 2 weeks of winter there. (There’s maybe 6 weeks in Yangon). Which is not to stay I don’t still love every minute! Update: you can get tourist visas on arrival through the government website! http://evisa.moip.gov.mm/ I got mine in less than 24 hours, very easy process. This is very good review for backpackers. I’ve been thinking to open hostel back in my homeland, Myanmar. So, this review gave me something I needed. Cheers. Hello, thank you for the useful information. I am planning to go this May/June, but its only a week trip, flying from Singapore. I just gone back from my Myanmar Trip. Myanmar is so interesting with full of attractions. I stayed in Myanmar for 8days, covering Yangon, Bagan & Mandalay and Inle Lake. It was an unforgotten trip for me. There are so many new hotels and service providers which are value with the money and services. Amonth them, 30th Street Corner Hotel in downtwon and M3 Hotel in Mandalay are the best. These hotels are located very near to the downtown and main attractions. Prices is very cheap although services ans facilitie are the best. Moreover, there are also cheap full day city tours which costs $15per pax in Yangon, Bagan and Mandalay. It is so nice and i could visit the main destinations of Myanmar, saving my time, money and engery because of this. Hope my experiences will catch up your needs. We are a family of 5 travelling to Myanmar in March. We have been told by our travelling agent that we could apply for Visa-on-arrival. You mention above that this is not the case. Do you know if this has changed recently? I last checked the official sources on this about a month ago. From what I understand visa-on-arrival is still only for business travellers from certain countries. Maybe there’s confusion about the terminology: visa on arrival means you can show up unannounced and just get stamped at the airport. For tourists there is an eVisa program – this is a convenient way to register for a visa, but still requires you applying in advance of your trip. Thank you for your answer. You were right . we mixed up the visa-on-arrival and eVisa. Thanks. 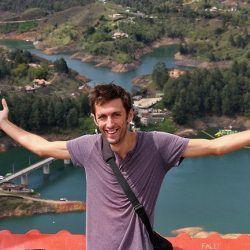 I am going to Yangon in a few days and was looking for info on where to stay as a backpacker. This helps. I am wondering where is the most happening place to stay and is it far from the airport?? Hi Nina. I stayed at Motherland Inn 2 in Yangon. Of all the places I stayed in Myanmar this one felt the most like a true backpacker hostel. It had a really friendly atmosphere and it’s a great place to start your trip. I believe you can get from the airport to the center by bus, though I personally was too tired and took a cab which cost about $10 if I recall correctly. Good luck! Thank you , Marek! I checked the the hostel you mentioned above, the least expensive rate was $27. I was looking more in the range of a $ 10-20 budget hotel. Would you happen to know if the don’t advertise lower fees online? Just curious? Again, thanks in advance. And in case you were wondering, I found you on Google through a search ; Yangon for backpackers . Wow, $27! It was $15 for a room when I was there, though it’s in the middle of high season right now so they must be cranking up the prices. 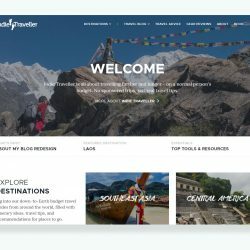 Not that many places in Myanmar can be booked easily online yet, though hostelworld.com has a few listings and they’re all in that price range. Might want to check those out. I’m traveling to Myanmar soon and this is very useful information. During my travels there I want to try and avoid using government run hotels/tourist stops/enterprises…any suggestions on how I could do that? Older guidebooks (pre-2012) will have info on how to avoid tourist money from flowing to the government. A lot of this is outdated now though, and you’ll probably find it difficult to find more up-to-date info as this is no longer a priority for many travellers since the government entered a (very difficult and imperfect) process of democratization. I have been told that many government-run businesses such as hotels are now privatized which often makes the issue moot. There’s good 1 day treks out of Hsipaw (didn’t do any myself, but other people in my hostel did). I also know there’s 1 day treks out of Kalaw near Lake Inle. I only did longer treks though so can’t make any personal recommendations! hello 🙂 I’m traveling to Myanmar next month (Nov 3 to 8). We are flying from BKK to Yangon. Any tips on how to explore Yangon – Mandalay – Bagan? Which place we should explore first. What about the local transportation 🙂 Thanks! Heya. Something I did was fly into Yangon from BKK, overland it to Mandalay/Bagan, and then fly back out from Mandalay, so that I didn’t have to backtrack. Buses are pretty comfortable and will get you anywhere. If you have a chance to take a train, I recommend that too, just for the experience of people-watching and being on a really old train. Do you know if it is still a problem to get through the border to Thailand from Myanmar? And I was planing my starting destination to be Yangon, is there any possibility to get your visa sorted from home (Denmark, Europe)? If Myanmar has an embassy in Denmark you can get a visa there. Another option is to use VisaHQ.com. The Thai/Myanmar border crossing has been opened to some degree but there can be some limitations – see the section ‘permitted areas for tourists’ for more on this. Flying in is typically the easiest. If Yangon is your starting point flying in with AirAsia from Chiang Mai or Bangkok should be cheap and easy. Is it flying in to Myanmar that is the important part to get it right with the permits or do one also need to fly out? Otherwise flying in and the go overland back to Thailand could be good? Thanks for this up-to-date information! I’ll prob go there this summer :)! Thanks for the information, very helpful. How long did you spend? I’m really keen to go and don’t want to rush but also don’t have unlimited time. I was thinking 2-3 weeks? I was there for 3 weeks which felt like enough to see the highlights without rushing (Bagan, Lake Inle, sights around Mandalay) plus seeing some less touristy sights as well. I believe the maximum visa period is still 4 weeks. Yep as far as I know. Great, thanks again, I feel comfortable planning for about 3 weeks then. Gotta have time for the trekking! I managed to squeeze in 3 days of trekking as well and it was wonderful. Def recommended! Thanks for this information, I’m planning a trip for next month.